From Fingal Bay we were just heading a couple of hours up the road to Lake Cathie (officially pronounced “cat-high” by the locals… but let’s just stick with “Cath-ee” for the sake of common sense. My parents have recently moved there, and our plans were to spend Christmas with them. We survived the masses of Lemmings on the Pacific Highway heading north, before heading to the coast. 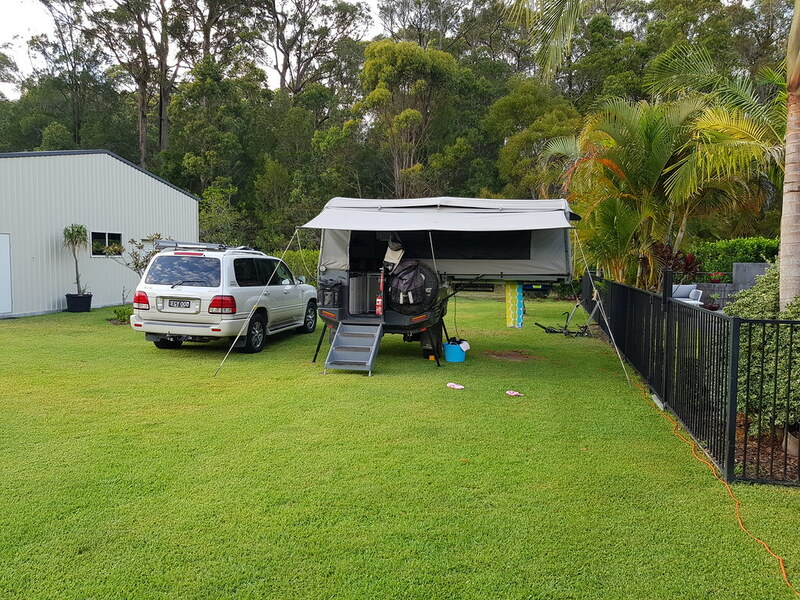 The kids were sleeping inside which meant no swags to set up, so it was a quick and easy set up for the Ultimate in their back yard. The house is on half an acre, so there was plenty of room next to the big shed! While at Fingal we discovered a couple of issues that needed to be fixed while we were here. The first was that we suspected the second battery in “Tan Stan” – the Lexus, was pretty much dead. It wasn’t holding charge, and the fuse that feeds power to it kept on blowing. So a Christmas Eve trip to Autobarn was in order to buy a new battery. Once installed, the fridge was able to keep beer cold again – essential over the holiday period. I also discovered that the merit plug that gives the fridge in the car power, also wasn’t locating very well in the socket and was shorting which caused the end of the plug to start to melt. For a while I’d been planning to switch that to an Anderson plug anyway, so this prompted me to get a spare plug out and do this. This was a Boxing Day job that was easy and quick to take care of. 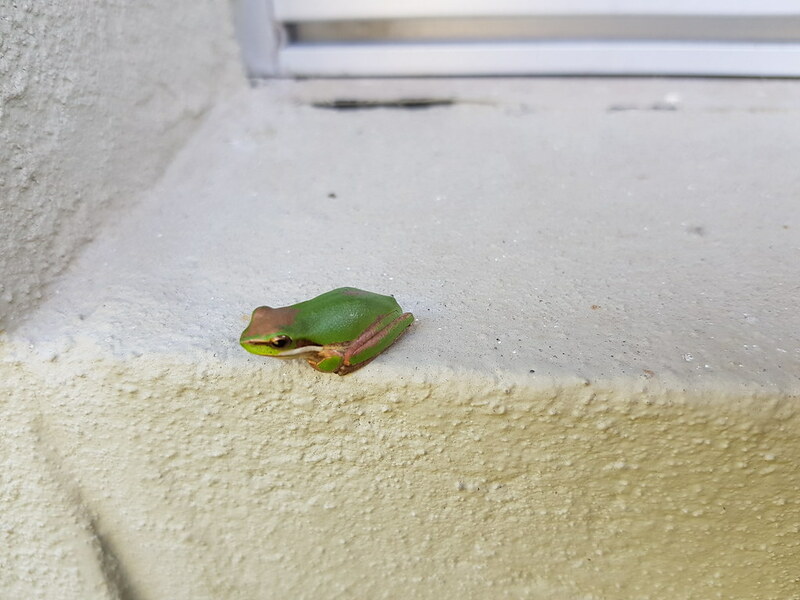 Lots of these little frogs around. They enjoyed the rain! One other issue that we had been experiencing, was that the isolator switch for the fridge in the Ultimate (yes, another fridge issue) was playing up. This meant that the fridge was running only when on 240v power, and not running from 12v. This was ok for now, but needed to be fixed before our next stop. Closer inspection revealed that the switch had indeed fallen apart on the back of it and so was a pretty easy fix with a replacement switch. Christmas Eve was an absolutely beautiful day, starting with bacon and egg breakfast. 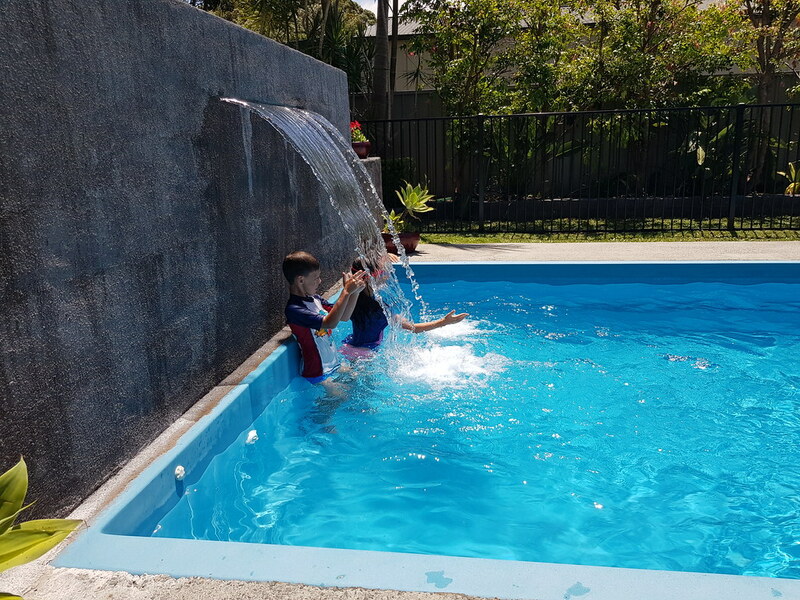 We got those few jobs done, got the drone out and did a few flights around the area, and the kids spent some time in the pool. 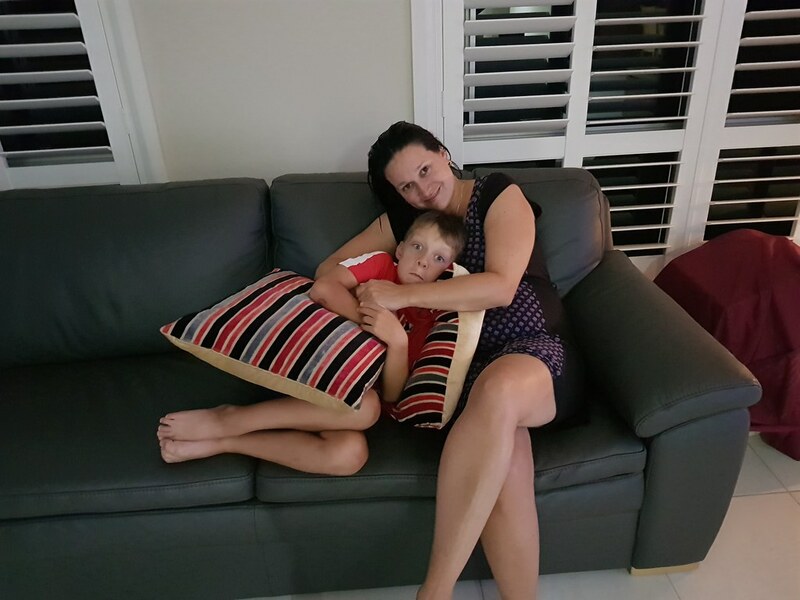 While watching the carols on TV, we were treated to a pretty spectacular electrical storm with lots of thunder and lightning, but only a little rain. 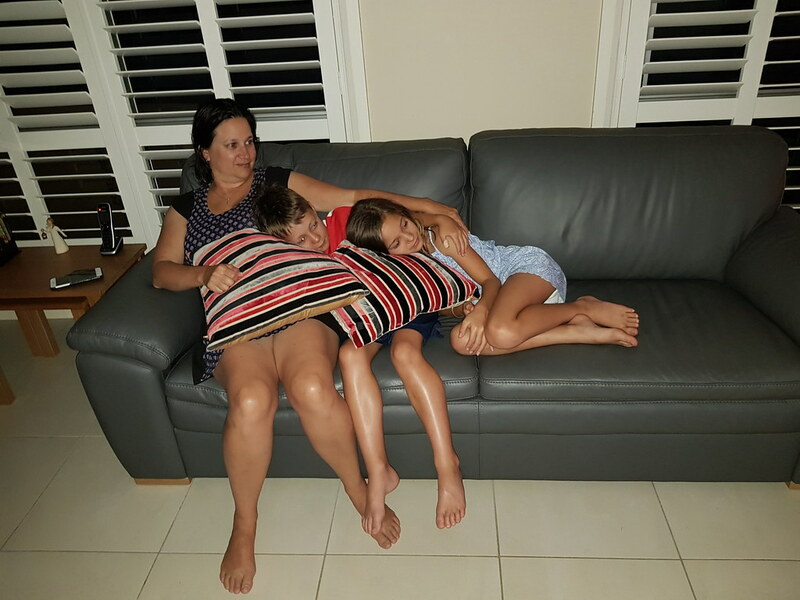 Watching Christmas Eve carols – hoping the storm goes away soon! 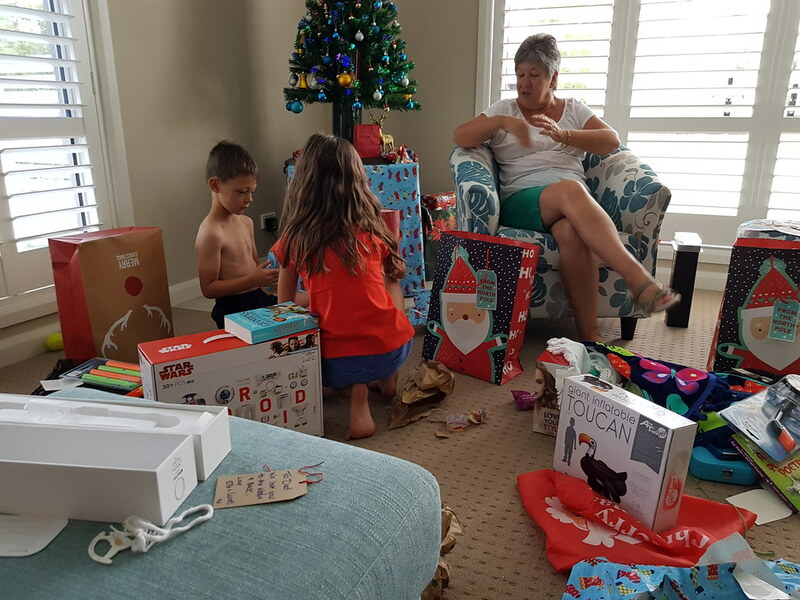 Christmas Day arrived for some excited kids, thankfully not too early! Everyone was spoilt with some great presents and we had a relaxing morning. Kids got some pool toys so spent some time in the pool before lunch. It was good timing as the weather cooled off a little during lunch and wasn’t really pool weather after then. We ended up going for a nice walk around their suburb to work off some of the lunch! There are some MTB trails not far from Mum and Dad’s place, so first thing Boxing Day I jumped on the bike and went for an explore. I only found about 10km of the 50km+ of trails, before a stick found its way into my rear derailleur and ended the ride. Fortunately I could limp home, but it would mean that the bike would end up being left in Port Macquarie at Gordon St Cycles to have that seen to – the holiday period would mean that parts wouldn’t be available until early January. It was lucky I got in any ride at all, as the rain set in (in a big way) not long after I got home – and didn’t really stop for the next 24 hours. During this time they received over 200mm of rain and a series of storms. Dad’s new 5000 litre water tanks on both the house and shed were both well and truly filled (probably a few times over!). After our last trip, I’d also made the decision to purchase a drone. 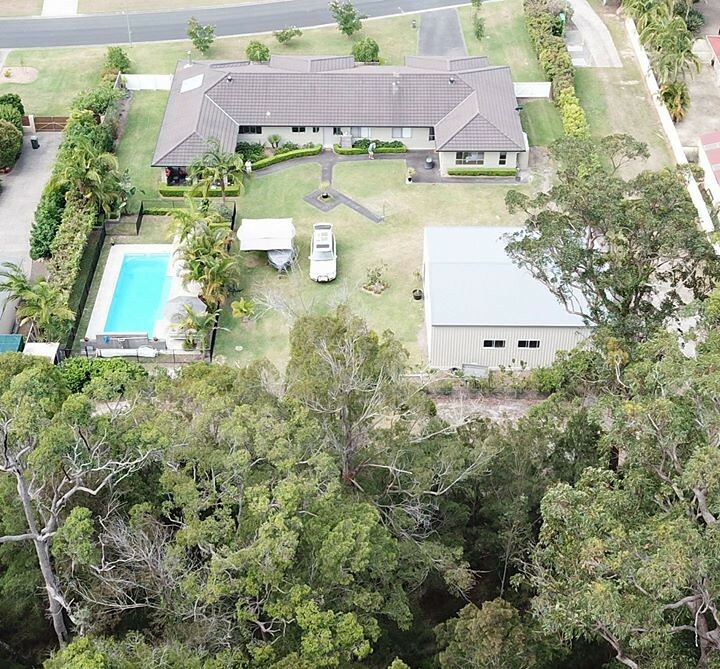 This was put to good use taking some aerial photos of Mum and Dad’s new place and having a bit of a fly over the bushland at the back of their house. Fingal Bay is a no fly zone due to its proximity to the Williamtown Air Force base, so I was pretty keen to have a bit of a fly. 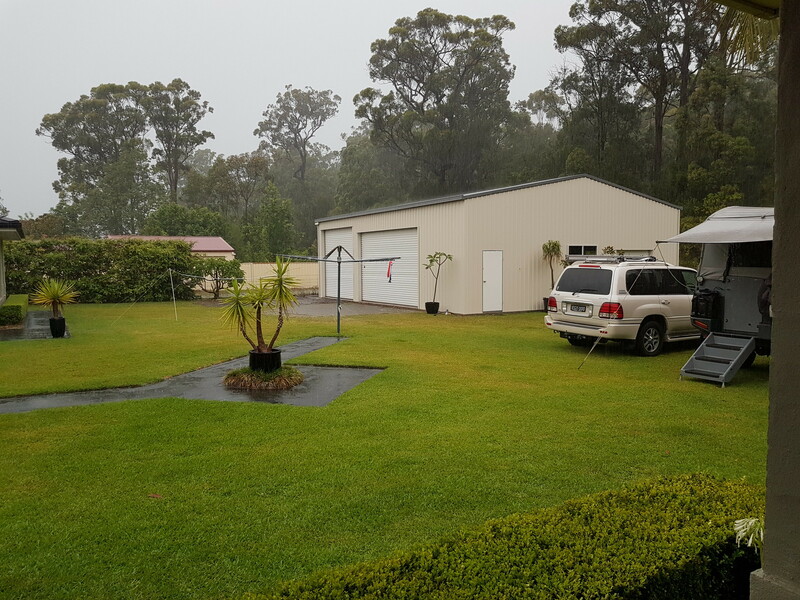 As the rain cleared we had an enjoyable but restful couple more days, the kids doing some archery and darts in the back yard, before it was time again for us to move on and meet Dave and Kate for our traditional New Year get together.